I saw this picture posted on Instagram by one of the old school wrestling pages I follow on there. Obviously I had to make a card out of it. I'm not a fan of wrestling these days, but boy was I ever as a kid. 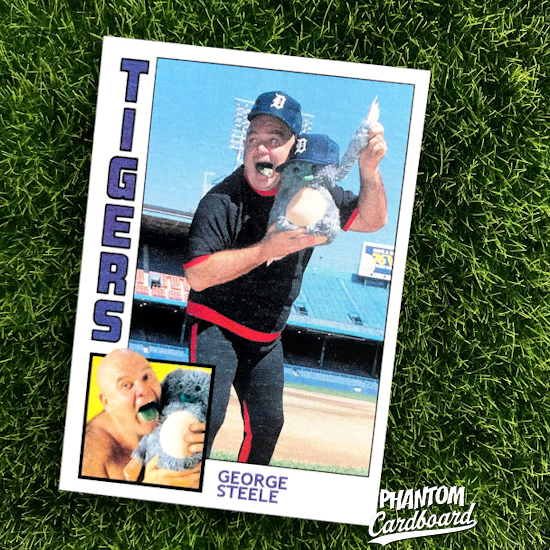 Everyone loved George "The Animal" Steele. Steele (real name Jim Myers) was a true character, something, in my opinion, that professional wrestling sorely lacks these days. Myers was also a high school phys. ed teacher and football coach here in Michigan, which was a non-kayfabe factoid that all us kids seemed to know somehow. I wasn't sure what year this photo was taken so I just went with a favorite, the 1984 Topps baseball inspired design. It's a good pick for this card because of the use of two images plus it's the last year the Detroit Tigers won the World Series.